Rare find expected to garner between $20,000-$30,000 in New York auction. Seventy years after V-E Day, the Nazis' surrender order has resurfaced - and will be auctioned off in New York. 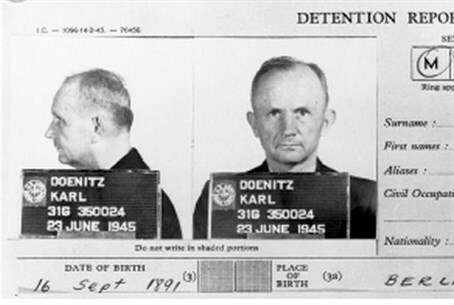 Nazi Navy chief Karl Dönitz wrote the order as he hid on a naval base in Northwest Germany on May 9, 1945. The surviving piece of telegram paper is expected to garner between $20,000-$30,000 in an auction Wednesday at Bonhams, according to the Guardian. In it, Dönitz orders an unconditional surrender and notes that all hostilities will cease at 1:00 am. “This was unavoidable in order to prevent the complete destruction of certain parts of the front, which was expected to occur in a short time, and, in so doing, to save as many people as possible for Germany,” Dönitz stated. Bonhams curator Tom Lamb noted that the telegraph's survival is rare; the Nazis had a "scorched-earth" policy that destroyed most of their records as the war ended. The slip of paper survived after it was found in the attache case of Luftwaffe Field Marshal Robert von Greim, to whom the notice is addressed, after he was arrested by US forces outside of Prague. Nazi memorabilia has become a popular - and controversial - auction house sale. Earlier this month, a British auction house auctioned off the suit of Gestapo leader Hermann Goering, after the curator noticed that the suit had sweat stains - distinguishing an original from a replica.